In the following tutorial, we are going to take you step by step through the SADDE6 arrival into Los Angeles International Airport. No longer will you have to tell the controller that you don't have the chart just so that he will vector you all the way. Hopefully, by the end of the tutorial you will enjoy flying these procedures and your ServInfo Flight Plans will look a lot like your real wold counterparts. For the purposes of this tutorial, I would recommend you print out the SADDE6 chart so that when we make reference to it, you will not have to keep scrolling up to view it. Before we begin, let's get some terminology down so that this tutorial will make sense to all of you. STAR: A preplanned instrument flight rule (IFR) air traffic control arrival procedure published for pilot use in graphic and/or textual form. STARs provide transition from the en route structure to an outer fix or an instrument approach fix/arrival waypoint in the terminal area. Transition: The Navaid at which you "Transition" or change from your en route route to a published procedure (the STAR). Minimum Enroute Altitude: The lowest published altitude between radio fixes which assures acceptable navigational signal coverage and meets obstacle clearance requirements between those fixes. Radial: A magnetic bearing extending from a VOR/VORTAC/TACAN navigation facility. Intersection: A point defined by any combination of courses, radials, or bearings of two or more navigational aids. Radio Magnetic Indicator (RMI): An aircraft navigational instrument coupled with a gyro compass or similar compass that indicates the direction of a selected NAVAID and indicates bearing with respect to the heading of the aircraft. VOR: A ground-based electronic navigation aid transmitting very high frequency navigation signals, 360 degrees in azimuth, oriented from magnetic north. 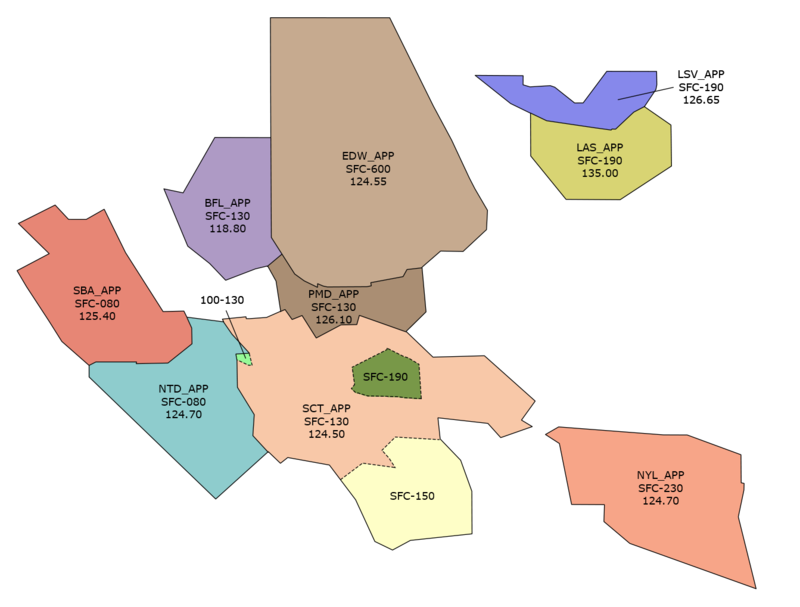 Used as the basis for navigation in the National Airspace System. The VOR periodically identifies itself by Morse Code and may have an additional voice identification feature. Throughout this tutorial, I will show you only the 360 degree compass, and both the VOR and RMI Needles. The VOR (or OBS or Course) heading is set to a particular radial and that is how you navigate along the STAR. The RMI needle just points in the direction of the tuned VOR, and shows the frequency and distance provided by your DME. Now that the jargon is out of the way, let's take a look at the STAR that we are going to be flying into Los Angeles, the SADDE6. This display is similar to those found on all MS Default Aircraft. Shown here is the compass, heading indicator, NAV1, NAV2, and ADF Frequencies. As you can see we have the Avenal VOR (AVE) tuned in NAV1 and are tracking the 129 radial outbound from the station, at a distance of 13.5 nautical miles. Reference the arrival chart, and you will see that from the AVE Transition, you follow the 129 radial outbound. So far so good right? Above and below where the chart says we track the 129 radial it has an 11,000 and a (29). 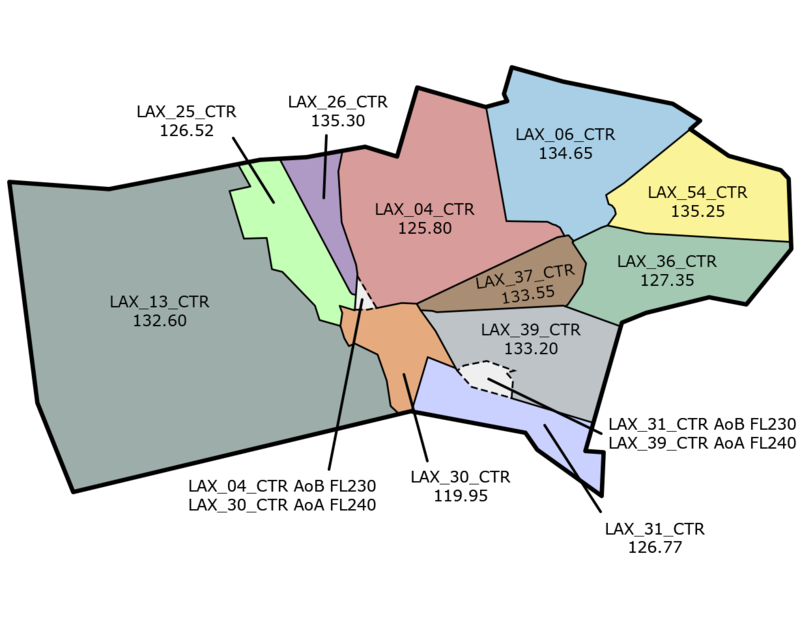 The 11,000 refers to the MEA of this particular segment of your route, while the 29 refers to the nautical miles in length that the current segment is. In this case, 29 nautical miles long. About this time you should have heard from Los Angeles Center to cross the SYMON intersection at 12,000 feet, and unless indicated otherwise, at 280 knots. For those of you with FMC's, you can set the crossing restriction, everyone else will have to take a rough estimate. Take the difference between your current altitude and your crossing altitude, and remove all but the first two numbers. For example if you're at FL330 (33,000 feet) and you need to cross SYMON at 12,000, subtract 12 from 33 (33-12 = 25) and multiply that number by 3. This means that at around -1800 fpm you will need 75 miles to make the descent. You also need to adjust your airspeed to make the 280 knots. (One final note here, all these airspeeds are IAS or indicated air speed, and NOT true airspeed, so make sure you have that checked in your realism settings.) We are currently a little too far out to receive the FIM VOR, so the DME is blank. All you have to do in this phase is to plan, and execute your descent, all while staying on this radial. Welcome to phase 2, as we neared the FIM VOR, the chart shows that you will need to leave the FIM VOR on the 148 radial outbound to SYMON (yes, that instersection you're supposed to cross at 12,000 and 280 knots (or otherwise instructed)). This is a very simple task, as soon as the DME numbers go blank on the ND, as they were in figure 1, you should start your turn to 148 degrees. You will not pick up any directional or distance information from the VOR while you are within a half a mile or so, so you have to plan ahead. Switch FIM to your NAV1 by typing ".n 112.50" into the chat box without the quotes. It will say NAV1 Set, and you will notive that FIM now comes up in white. Change the course to 148 as that is the radial we want to track outbound from the station. As you pass the station, it will come back with the distance and you will notice that you are a little bit off the radial (remember, VOR's are very sensitive close to the station, and less so as you get farther away). Track that radial outbound for 20 miles, and you will be at the SADDE intersection, but we have some work to do before we get there, so proceed to phase 3 and let's get those passengers on the ground. By now you should be at the SYMON intersection at 12,000 and at whatever speed ATC gives you. We now have 8 more miles to travel and we will ht the SADDE intersection (for which the STAR is named). The intersection is where the FIM 148 radial and the SMO 261 radial intersect. The chart shows us that we need to track the SMO 261 radial inbound (that's a course of 081 remember) and that will take us over BAYST (which ATC will tell you to cross at 10,000) and eventually direct to the SMO VOR. Back to the present however. As we near about 15 miles or so from the FIM VOR, we will notice that at SADDE, we have to track the SMO 261 radial inbound (again .. course of 081) Now is the time to switch NAV1 to SMO (110.8) and keep NAV2 on FIM so that we know when we're at SADDE, and need to turn. When you see the needle start to move (that pink rectangle) you need to start your turn to a heading of 081. The DME information from the FIM VOR is to double check our turn, and make sure that we do not turn too early or too late. When the DME to FIM is 20 nm, then we are over SADDE, and hopefully in our turn to the east. Depending on the controller, you may have been told to cross BAYST at 10,000 and the Santa Monica (SMO) VOR at 7,000 (or just SMO at 7,000) as well as instructions to depart Santa Monica on a heading of 070, which we will cover in phase 4. This is a sharp turn that requires some timing, and advanced planning so we'll leave Phase 3 here. Congratulations, you made that sharp turn, and your ND should look just like this. As you sharp pilots have undoubtedly noticed, the TO-FROM Indicator shows that we are headed towards the station, that we are on the 261 radial inbound, and that we are 8 miles from the VOR. In addition, you were instructed to cross SMO at 7,000 feet, so you should be fairly close to that altitude (if you crossed BAYST at 10,000 you may be a little higher as we're only two miles from that intersection). The hardest parts of this STAR are done, so now it's all a piece of cake. 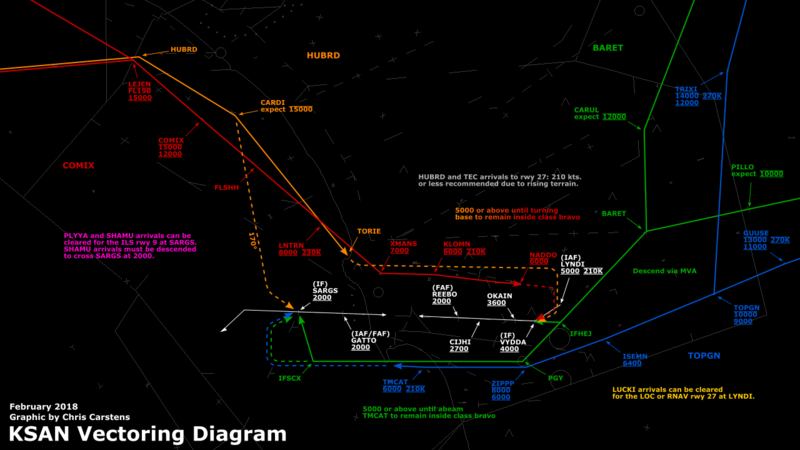 Approach will then instruct you to depart the SMO VOR heading 070 vectors for the approach. 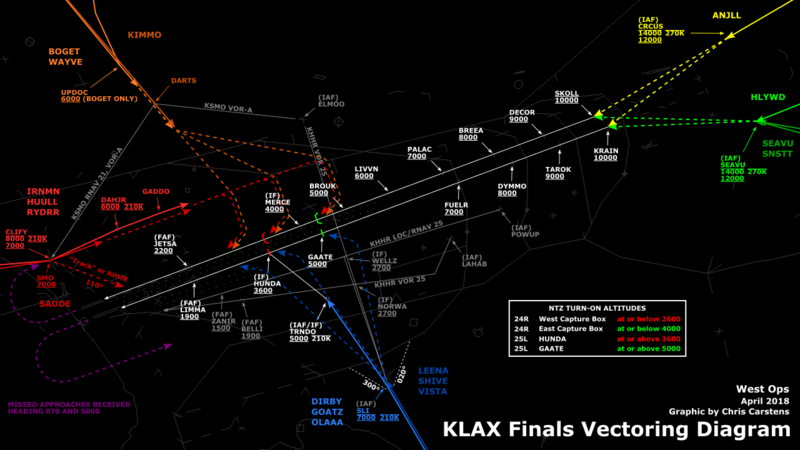 If it's a clear day, you should have a really good view of KLAX right now, and you could ask the controller for the visual approach, or just call the field in sight and he may issue it to you. Assuming the weather is IMC, we'll take the tutorial for the ILS Approach (both the ILS and Visual Approaches are covered in a different section). Phase 4 is just a checkup phase. Bring up the landing checklists, and make sure the seatbelt signs are illuminated. After you depart the VOR heading 070, the STAR is over, essentially just leaving you with a right downwind to runway 24R. 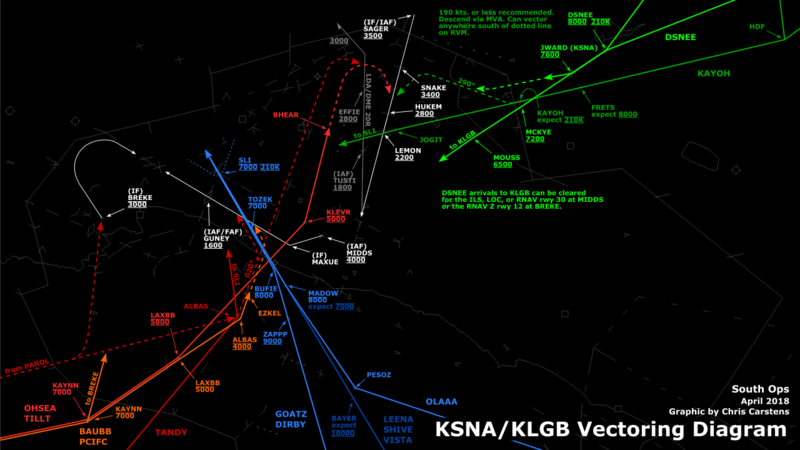 Take this free time to look out for any traffic, familiarize yourself with the ILS Approach Plate, and get a good idea of where you are. You will soon be turned for the ILS and then it's smooth sailing... right? Welcome to the last phase of the STAR Tutorial. As you can see, while I am on that heading of 070, and on my way down to whatever altitude ATC reduced me to, (probably 2,500) I went ahead and changed my NAV1 to the ILS frequency for 24R which is 108.50, and set the course heading of 249 (runway heading, given on the chart.) As you can see, I am north of the Localizer, and high. Not to worry, that will all soon change. However, everything beyond this point is an ILS Approach, which you will be vectored onto, and is beyond the scope of this tutorial. Congratulations, you have successfully flown the SADDE6 arrival, either manually (like I did to take these pictures) or with your FMC. I hope this tutorial has helped you learn how easy it really is (and fun) to fly the Standard Arrivals into the major airports. It will add a whole new degree of realism to your flying experience, and I hope you have as much fun learning to fly these tutorials as I did making them for you.